The Riverfront Ballroom is completed with breathtaking crystal chandeliers and matching wall scones, which can be dimmed to create the perfect setting for any special occasion. 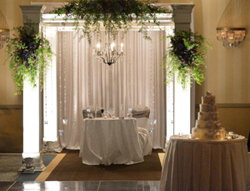 This enchanting ballroom can accommodate up to 220 guests for a wedding ceremony. A separate entrance through the large Ballroom Foyer allows for an elegant space to socialize during the evening’s activities. For a personal tour, please contact us today. The Falls Library , which features an elegant copper hooded fireplace , dark paneled walls plus a large picture window overlooking the river, creates a sophisticated private room for many special occasions. 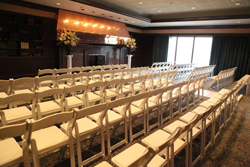 The room can accommodate up to 100 guests for a ceremony or 80 for a sit down dinner party. 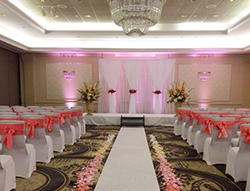 Make use of the Library and the Cuyahoga Junior Ballroom for a perfect combination to host your intimate wedding ceremony and reception. For a personal tour , please contact us today.